Italian made SUP for sale. Pictured above: The Italian made SUP is put through it's paces at Trigg Beach. Italian made SUP for sale. Hand made 16 foot 8 inches long x 36 inches wide and 12 inches thick. Comes with handmade wood paddle, awning, Engel Fridge, Micro-wave and Expresso Machine. Easy to manouvre, great in big waves. 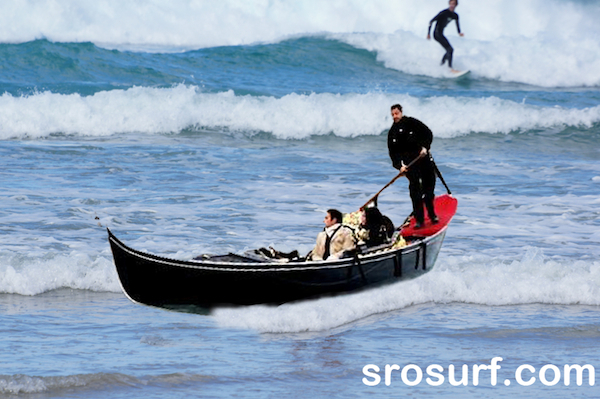 Ideal for those crowded days in the line-up, easy to take 30 surfers out at once while they are paddling out if you lose control of this SUP. Hog even more waves than some of the other SUP riders on this beauty. Has been blessed by the pope and have won the "Vatican Surfmasters" prestented by Pope on a rope, Ginos Pasta, Vinnies Pizzarea, IMA (Italian Mafia Association). Unique construction glassed using Lasagne strips. Good condition, no dings (That's board damage I mean). $120, 000.00 o.n.o (if not sold will take to Cash converters.